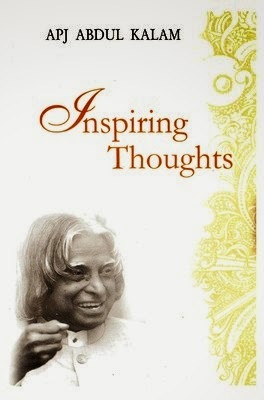 Published in the year 2007, the book Inspiring Thoughts by A.P.J Abdul Kalam is an excellent book that aims at enabling the reader to think high, for a better tomorrow. In this book, Inspiring Thoughts, the author boosts the morale of the readers in a unique way, which is thought provoking and inspires the readers to act. The author also stirs up the readers to make the correct decisions in the present, which will influence the nation in the future. Kalam directs certain advice towards children, which will help them think higher. This is because he believes that children are the nation’s future, and that ambition in these children will help them take the country to greater heights. In Inspiring Thoughts, he also urges the readers to take the path that hasn’t been tread, explore it, and achieve seemingly impossible goals. Although this book is written for a large audience, it is highly recommended for those who have experienced failures in life as it will help them start again with renewed passion to succeed. The author conveys the message to the readers in the form of personal sayings. The author of this book, A.P.J. Abdul Kalam, is a renowned scientist. He held the position of India’s 11th president from the year 2002 to 2007. He is commonly referred to as Missile Man of India, for his immense contribution to the development in ballistic and vehicle technology. Apart from writing this book, Kalam has also published several other books. Some of the literary works of A.P.J Abdul Kalam include Spirit Of India (Reflecting The Concerns), Addmya Sahas Indomitable Spirit, and You are Unique. He has also published a book named India 2020: A Vision For The New Millennium, which displays his passion to see the nation developed by the year 2020. He was born on the 15th of October 1931, in Rameswaram, Tamil Nadu. He completed his degree from St. Joseph's College, Tiruchirappalli, studying Physics, followed by a degree from the Madras Institute of Technology, Chennai, where he studied Aerospace Engineering. Through the length of his service, he has been awarded the Bharat Ratna, Padma Vibhushan, and Padma Bhushan awards, to name a few.